We’ve been taking her picture season after season. With every look she wears she surprises us. 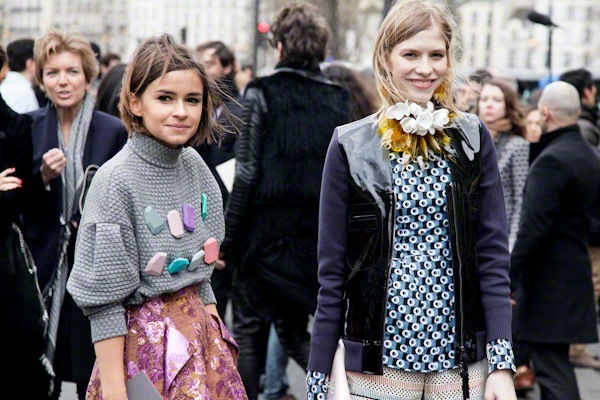 Time to take a closer look at Miroslava Duma’s style. This former Harper’s Bazaar editor is without a doubt one of our favorite streetstyle targets. Within one fashion week she’ll change her looks from sporty to couture and from quirky to classy and manages to always stay true to her own style. Mira, as her friends call her, mixes Chloé with Chanel and Marni with Acne. She stays high on above the ground in stunning heels and eye catching wedges from Christian Louboutin to Alaïa. Almost every single one of her looks is finished off by a chunky necklace, of which Mira must own countless versions. And if you thought Mira was just about pretty clothes, you’ve got it all wrong. Besides her amazing style and good looks this pint-sized fashionista has the brains too. She not only regularly collaborates with great fashion titles like Ok, Tatler and Glamour, but also founded her own fashion website called Buro 24/7, which is gaining more and more attention. Take a look at her style and see why we are so fond of this Russian streetstyle sensation.